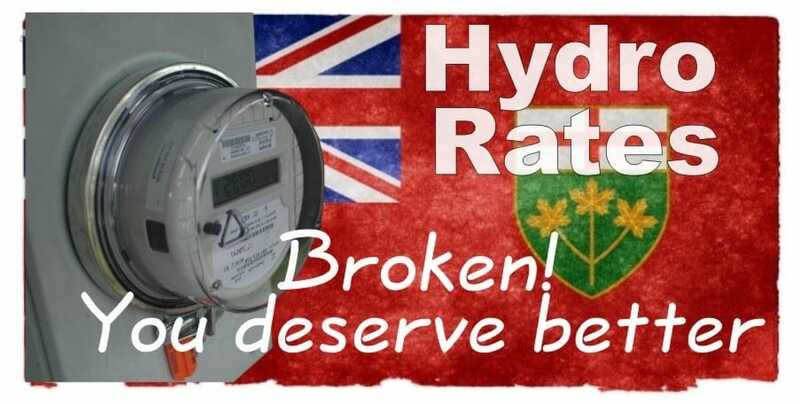 The Trillium Party believes that Ontario produces excess hydro to the point of having to PAY OUR AMERICAN and PROVINCIAL neighbours to take it away for us. All the while our rates are continuing to be increased. This simply doesn’t make sense! ​This has been caused in large part because of the extremely poor business contracts made regarding the wind/solar generation and FIT programs, with wind/solar power costs at approx., 83 cents per kw/hr, and with the government having made deals to pay EVEN IF WE DON’T USE THE POWER, that’s 24/7 paying for something that we don’t use. In approximate numbers: Water generated hydro costs 2.5 cents per kw/hr, and Nuclear energy costs 4.5 cents per kw/hr. Our homes need less expensive power and our manufacturers need less expensive power to keep jobs in Ontario. The Green Energy Act will be repealed. FIT contracts will be lawfully cancelled. Any corporate monopolies created, that are not completely publicly owned and operated, will be cancelled as in violation of the law, unless it can be proven to be of greater benefit to the people of Ontario. Those involved in any breaches of the trust or in violation of the provincial and/or federal law will be brought forward to the justice system for full investigation and charges will be laid to ensure public confidence in government. There will be no payment for “stand-by” producers and they will only be paid when and for what they are producing. There will be no charge created to “force people to conserve.” That is the individual’s decision and government is not to be in the business of indirectly taxing the people for use of energy/electricity. Industrial wind turbines that effect neighboring property owners will be dismantled and/or decommissioned at the cost of the energy company. All set-backs which over-lap someone else’s property will be considered as an expropriation and full, fair compensation shall be paid by the company. Anyone can install private solar and small wind or water turbines for their own use, which does not affect others, and any extra electricity produced beyond the owner’s use can be fed back into the grid for credit or payment. Accusation: The Trillium Party can say whatever they want because they know that they won’t be in government. During Committee on the Liberal Fair Hydro Plan, to cut the cost of electricity pricing for 4 years to Ontarians, one of our Candidates made a presentation to the government committee on this Bill. Our Candidate brought in the fact that government was in violation of the purpose of the Electricity Act and was violating government’s fiduciary duty to the people of Ontario. The accounting practices are unnecessarily cost Ontarians billions of dollars. The A.G’s Office does not question the government’s Policy Decision to reduce Ontarians’ electricity bills, but it has concerns that the intention, of government, was to avoid showing a deficit in the Province’s budgets and consolidated financial statements for 2017/18 to 2019/20, and to likewise show no increase in the Provincial net debt. The A.G. states that this action by government is incorrect and the planned financing structure could result in significant unnecessary costs for Ontarians. The A.G.’s report states that ratepayer’s electricity bills will be lower than the cost of the electricity and that the power generation will still be owed at full cost. This means that the government will have to borrow to cover the debt created. The debt should become part of the deficit but government is not property accounting for the impact of this debt in the budget and is “not planning to account for it property in its future consolidated financial statements.” In her words ” government is making up its own accounting rules.” One would think this is so wrong on so many levels its almost criminal, wouldn’t they? And based on the A.G’s numbers we will be on the hook for $4 billion more than is needed just because of this accounting scheme. Is this FAIR? Obviously not…that is why the Trillium Party of Ontario is looking to strengthen the Auditor General’s Office so that this office can perform value-for-money audits and seek out government fraud. The Trillium Party of Ontario – Something Different Something Way Better for Ontario! Ontario residents and businesses deserve to purchase electricity at the lowest price that it is offered to anyone in other provinces or in the U.S.A.
We will eliminate subsidies for non-reliable renewable electricity sources. Section (2) (a) requires that the highest priority is placed on ensuring that residents and businesses get electricity at the lowest possible cost by making maximum use of the extremely valuable electricity generation facilities that the public already owns and by establishing real transparency in the process that influence the price of electricity with a view to making it possible to reduce or eliminate unreasonable costs. Section (2) (c) directs the Minister to terminate the conservation subsidy programs that the Auditor General has confirmed have added significant costs to the electricity bill of businesses and residents in Ontario. Section (2) (d) directs the minister to establish regulations to improve the efficiency and to reduce the costs of running the electricity grid and to ensure that cost reductions and the opportunities for future savings are passed on to electricity users. Section (2) (e) aims to ensure that electricity prices are set in a rational way by preventing the lowering of prices now by pushing even higher payments which include additional interest costs into the future. Section (2) (f) aims to have energy bills show the real effect on the price that consumers will have to pay for electricity in the future – and to tie those future prices to specific policies that have already been imposed by government to defer current costs, to add interest charges and to make consumers pay more in the future. Section (2) (g) aims to have energy bills clearly identify the portion of current electricity bills that is caused by specific decisions by government that have burdened customers with higher electricity bills today – to cover the costs of arrangements made to hide past debts. Section (2) (h) aims to ensure that the electricity system in Ontario is operated in a way that will provide maximum benefits to the citizens and businesses of Ontario – by modifying smart meters to allow customers to get minute-by-minute real time pricing and by ensuring that Ontario residents and businesses can purchase electricity at the lowest price that it is offered to anyone in other provinces or in the U.S.A. The Affordable Electricity Act, 2018 is enacted. The Act imposes a duty on the Minister of Energy to ensure that residents and small businesses in Ontario have access to clean electricity at the lowest possible cost and sets out several requirements that must be met by December 31, 2018, in order for that duty to be fulfilled. (1) The Minister of Energy shall ensure that residents and small businesses in Ontario have access to clean electricity at the lowest possible cost. (iii) implementing regulatory and policy changes to ensure that customers benefit from reduced costs that result from more efficient use of the electricity system. 3. The short title of this Act is the Affordable Electricity Act, 2018.